An Alaska road trip is the ultimate outdoor adventure lover and enthusiast playground! There are six mountain ranges in the state and an unlimited amount of wilderness for you to explore. You will take pictures that are world class and ready for publishing. Nowhere else in the world can you walk up to a glacier, see the Northern Lights in winter, sunbathe any time of the day in the summer, and watch grizzly bears feast on salmon at a waterfall. Kenai Peninsula is a great place to pan for gold and is an activity that can potentially pay for your entire trip. 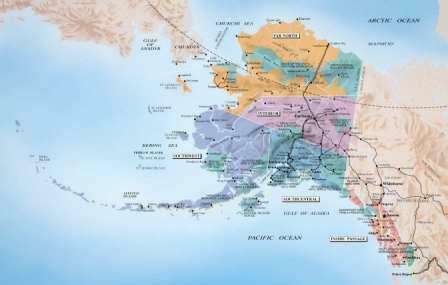 Anchorage: This city is what many refer to as the Gateway to Alaska, and you will likely arrive on a train or on an airline in downtown Anchorage. Before heading out into the wilderness or on your cruise it is worth exploring Anchorage for a day. There are several restaurants that serve the best Alaskan King-Crab legs in the world! When your are downtown make sure to walk around the gardens at the Visitor Information Center because it is filled with some amazing wildflowers and photo opportunities. If your looking for nightlife then you'll want to check out Chillkoot Charlie's on Spenard Rd or the Crow's Nest. Mr. Whitekeys Fly By Night Club generally has live music and is worth stopping by. Check out what's going on in Anchorage and begin planning your Alaskan Road Trip. Fairbanks: If you want to check out the Northern Lights then you'll want to visit Fairbanks in the winter. It's bitterly cold in the winter and dark 22 hours of the day so you will want to dress accordingly . National Parks: The National Parks in Alaska are absolutely spectacular and like nowhere else in the world. Much of the land is not accessible by car and the wildlife is not acclimated to humans. A well-planned backpacking trip in these parts will be a trip you will remember for the rest of your life and you will talk about often. Glacier Bay is a great place to charter a fishing boat or catch a cruise through the Bay to see the amazing marine life. Wrangell St. Elias is a massive park that is offers the ultimate camping and backpacking adventure. The park is so large in fact that you could fit Yellowstone National Park inside of it-SIX TIMES! Bear Watching: One activity you can enjoy in Alaska and nowhere else in the world is Grizzly Bear Watching. A visit to Katmai National Park will provide you the once in a lifetime opportunity to witness these magnificent creatures feast on salmon during the annual salmon runs. You will be amazed at how close you are to the wildlife on this viewing deck. You'll want to plan this portion of your trip one year in advance because space is limited and the demand is extremely high. Denali National Park: Denali is an absolutely enormous park that is secluded but well worth the drive from Anchorage. Once inside the park there are no amenities or places to buy your road trip provisions. Vehicles are not permitted past the visitor center but there is a bus system that is top notch and will take you through the park. These busses will stop so that you can view the wildlife and snap some amazing pictures. If you camp in Denali you can get on and off the busses each day and explore different sections of the park each day and then return to your camp for a great meal. Mount McKinley is towards the end of the bus route and because of the clouds you will only be able to see the mountain 20% of the time. Wineries: Alaskan Raspberries and Blueberries are commonly used to make this wines in this state. It's worth grabbing a bottle to enjoy on a rainy evening you may experience during your vacation. White Water Rafting: There are several rafting adventures available in Alaska and take you through some spectacular views of the landscape. It's a great way to spend a day and get a new perspective on how wild the area truly is. Although the waves are not as big as the Colorado or the New River in West Virginia they need to be taken seriously. We highly recommend wearing a dry suit and dressing accordingly because the water is cold! Outdoor Festivals The Fairbanks Summer Arts is a great anchor activity if your visit to Alaska falls during it's schedule. If you are near Kenai during the 4th of July you will want to explore this town and check out the buzz around town. Make sure you arrive a couple days early to reserve your camping spot because it fills up quickly! Most of Alaska is unexplored and waiting for you to get lost in it's vast wilderness. The beaches will offer you countless spots to look at the marine wildlife and toss your line into the water for a quick fishing trip. The tides in Alaska are dramatic and you will want to make sure you don't pitch your tent too close to the water's edge.